Jon Stehle is serving his first term as a Councilmember on City Council. Jon has been a resident of the City of Fairfax since 2007. Jon previously served as the chairman of the City of Fairfax Parks and Recreation Advisory Board. He has also served on the Green Acres Feasibility Study Committee and on the City of Fairfax Branding Advisory Committee. For more on Jon's work as Councilmember see Jon's Councilmember page. For the latest information on the events in the City of Fairfax, including Council Meetings, see the City Calendar page. Jon is currently the business director for Perfoma. Prior to joining Performa, Jon was a strategic performance management lead at MITRE and was a senior analyst with the U.S. Government Accountability Office (GAO). Jon received a GAO Meritorious Service Award in 2013 for his contributions to GAO’s High Risk program and Key Issues website by leading colleagues across GAO in enhancing the use of GAO’s work by Congress and the public. Since 2011, Jon is has served on the Board of Directors of his townhome condominium. During his five years as President of the Board of Directors, he led the creation of the community strategic plan, resulting in more engagement of community members and an increase in transparency, especially in regards to the community’s budget. Further, he led the community in the development and implementation of a three year landscape improvement plan. Born and raised in Butler, PA, a small town just north of Pittsburgh, Jon received his BA in History from Washington & Jefferson College (W&J). He and his wife Stephanie met in 6th grade while playing on the same soccer team (coached by Jon’s mom and Steph’s dad). They have been together since before their senior prom. They were married in their home town of Butler at St. Peter’s Catholic Church in 2005. In 2009, they welcomed their daughter Zoe into the family and in 2012, their son Cooper. 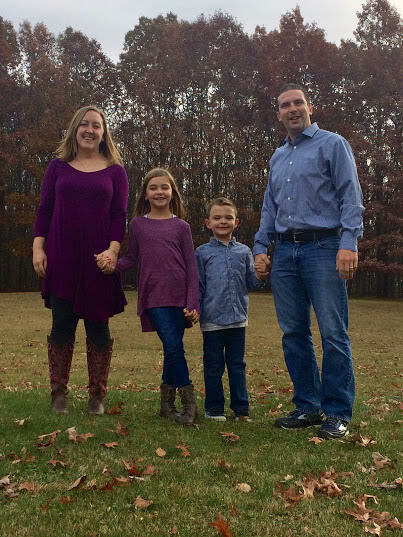 Steph is currently pursuing her PhD in Science Education Research at George Mason University following over 12 years as a high school physics teacher, and including nine years teaching at Oakton High School, where she is still active as the Varsity Assistant softball coach. Jon has played and coached ice hockey and lacrosse at many levels. He was the U-15/U-13 Girls Lacrosse Head Coach for South County Athletic Association, the Freshmen Head Coach for the Woodbridege Ice Hockey Club and the Boys Varsity Lacrosse Coach for Taylor Allerdice High School in Pittsburgh PA. He played ACHA Division 1 Collegiate Hockey for W&J and was a two-time ACHA Academic All American. He was a founding member of the W&J NCAA Division III Lacrosse team. Jon is very excited to again be coaching Zoe with Steph for the Fairfax Police Youth Club (FPYC) Girls Lacrosse program. Both Zoe and Cooper are also currently learning to play ice hockey.